Managua We rolled out at dawn for Matagalpa with Managua stirring all around us as the city waited on corners for buses to work. In two and a half hours ,we were rolling up the narrow streets and steep hills looking for the gas station near the Centro, which was our landmark, in a journey that took twice as long in 1981 and included some dirt roads in patches. 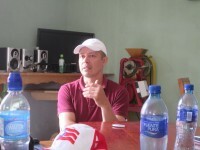 We were meeting Ervin Calixto Miranda, the secretary general of the COOMPROCOM coffee cooperative. We wanted to see the impact of the roya or coffee rust epidemic firsthand, as well as understanding more about the challenges faced by cooperatives in contemporary Nicaragua. If you ever want to fully understand from nuts to bolts how a coffee cooperative works, and the immense challenges they face, particularly financial, find Ervin! 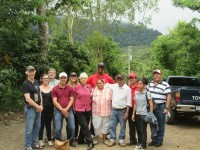 Before we left to scale the mountain and visit several farms (fincas), Senor Calixto gave us a master class in the financial struggles of a cooperative and its individual farmers. Ervin had been raised on a farm, as had all of his staff, and managed to go to university and a career in finance, before coming home to the cooperative, so he could break it down for us. COOMPROCOM started in 2002 with 52 members and now has grown to 250. In the beginning they were 100% organic, but are only 40% now, and roya is no small part of the problem, though economics are also challenging as well. For their organic and fairtrade coffee some of their farmers have a series of certifications, all of which cost them money and make them money. 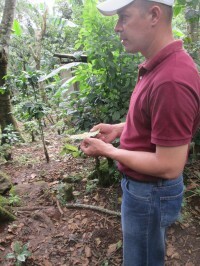 Organic certification gives the producer 30 cents more per pound, and costs 5 cents per pound of coffee to achieve. Fairtrade certification from FLO, the Fairtrade Licensing Organization in Bonn, Germany gives them another 20 cents/pound and costs 3 cents, and those that have the additional Rainforest Action Network certification make another 15 cents/pound at a cost of 5 cents/pound. It all adds up and for those farmers growing conventional Arabica beans, they can get almost as much per quintal, without the costs and the years of work to achieve the number. 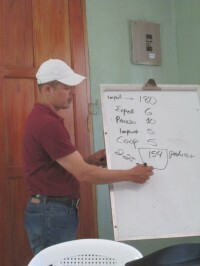 A farmer gets $160 per quintal for conventional and about $180 with the certifications. A quintal is a classic weight measurement that is the standard for Central American coffee and equals a hundred kilograms or roughly 220 pounds. Ervin broke out the rest of the costs per quintal for us as well. Processing would cost $10, taxes $5, and they were rising, exporting would be another $6.00, the Cooperative fees were 5 cents per pound or about $10, if I followed him correctly. The farmer is lucky to have $154 from the $180 quintal, which is part of the short term tension between conventional and the whole package. You have to believe that the savings on different pesticides will be offset over time. All of which is challenged by the roya epidemic which we saw firsthand up the mountain. One small farm we visited had lost 90% of his production. The last two years saw the roya reduce 25% of production across the coop for the first attack, and then 13% more in the second attack in the second year for an average decline of 38%. Organic plants are hit worse. Ervin and some of the farmers showed us their work in pruning to strengthen the plant as well as the new plants being put into production for the next three year growing cycle. They were experimenting with a more resistant form of coffee plant, but couldn’t tell if it would match the quality standard. Part of the roya problem is that it reduces the quality by weakening the bean and a cup rating of 82 won’t sell, while there will be a line for an 86 cup. 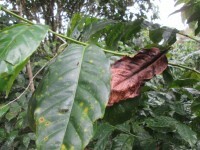 We saw some plants with the roya spots still on them that were now resistant. One small farm with loans from the coop was going through the whole process of rebuilding his crop to top certifications. 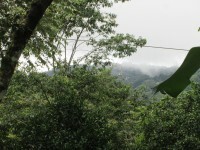 Where we visited at 2100 meters or almost 6900 feet on the climatic edge of the rain forest, the coffee plants were luxuriant. This was a well-run cooperative, and it seemed that the right steps were being taken, and they would make it. Drummond Pike, who had visited 30 years ago, when cooperatives were a dream, saw real hope here, as all of us did, but they were doing it on their own. The financing was tenuous and based on contracts and long standing relationships with their broker in England and their markets there and in the USA, so there was no government assistance, credit was thin, and growth past 300 members seemed untenable in their view for protecting quality standards. Meanwhile fewer children were staying on the farms. The roya was pushing them into other crops while they regenerated the farms. Worse, the math was precarious. Producers getting less than a dollar a pound at the ground level for coffee selling at least that and often double and triple for the consumer, is a market efficiency that continues to leave the farmer in perilous shape in rough living conditions and hard work, and those of us supporting fairtrade coffee wondering if all of this is sustainable either at the back end or the frontend. New Orleans Sometimes you know it’s bad, but you still haven’t wrapped your mind around the full ripple effects of how bad it might be. Focusing on the immigration crisis for children and families at the Mexico-United States border, I have concentrated on the problems we knew were coming from communities organized by ACORN International, especially in San Pedro Sula and Tegucigalpa, which have been among the leading areas that children are fleeing. 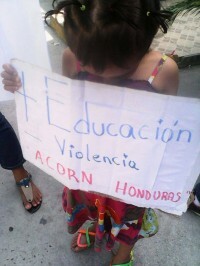 ACORN Honduras members – and mothers – demonstrated in both cities recently both at the American Embassy in Tegucigalpa and at the First Lady’s office in San Pedro Sula, demanding more security from gangs and violence to protect their children. There’s no question that narco-war and gang violence in Central America is driving an exodus. Another factor, less reported, but arguably significant is not in the cities, but in the economic devastation that is now hitting the rural areas where coffee growing farmers and their cooperatives grow some of the finest Arabica coffee beans in the world. Preparing to interview someone recently returned from the region, a statistic in the Wall Street Journal woke me up to the severity of the crisis when they estimated the economic damage in the region this year as likely $500 million in lost sales and 350,000 jobs lost in the countryside. Stanley Kuehn is a fellow who hasn’t shaken the natural Texas twang from being raised in Rio Grande City, a poor community along the border where I’ve stopped more than once, and when you ask him where he works there’s an alphabet soup that spills out. 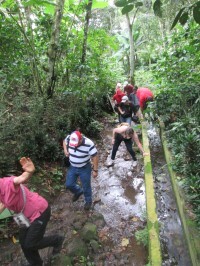 The simplest part of it is that he is the regional director for Latin America and the Caribbean. The longer spiel is that he represents the National Cooperative Business Association and the Cooperative League USA and is also tied into something else called VEGA, the Volunteers for Economic Growth Alliance. Whew! Trust me though, after interviewing him during Wade’s World on KABF/FM. if you can make it through the alphabet there, the message is vital. 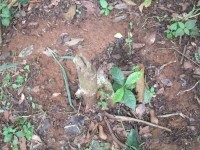 Stanley says that the devastation to the coffee crop is huge. Honduras may be the lightest hit with 25% losses, but Costa Rica, Guatemala, El Salvador, and Nicaragua are all either moving towards 50% losses or already up to 60%. Losing this much of this cash crop will decimate some communities. The cause? Stanley says it is climate change more than anything else. 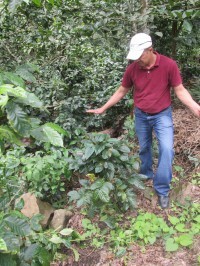 Coffee plants have gotten weaker with rising temperatures, less shade, abandoned plots without proper pruning, hotter summers and cooler winters, all of which have combined into something unstoppable. The roya fungus originated in Ethiopia some years ago, but has accelerated now. The fix isn’t simple. There are organic pesticides and better pruning methods that can save some trees and will make a difference in the future, but where they have to be cut down and replanted it will mean five or six years until good beans can be replaced. Coffee drinkers will get their fix by paying some higher prices for the good stuff or drinking robusta from Brazil on the cheap end, but many of the farmers and their cooperatives will be decimated in the meantime. We’re going to have to talk to Stanley more. He’s relocating to Salvador this coming January to go hands-on one-hundred percent. He needs help from farmers or anyone who wants to put their back to the job. We’re going to see more families from Central America forced to become economic refugees. This will be a bitter brew for years in the region.